PMR utilizes a triangulation methodology that is primarily based on experimental techniques such as patient-level data, to obtain precise market estimations and insights on Molecule and Drug Classes, API Formulations and preferred modes of administration. Bottom-up approach is always used to obtain insightful data for the specific country/regions. The country specific data is again analysed to derive data at a global level. This methodology ensures high quality and accuracy of information. The non-invasive stem cell obtaining procedure, augmented possibility of accomplishing high quality cells, and lower price of therapy coupled with high success rate of positive outcomes have collectively made allogeneic stem cell therapy a preference for veterinary physicians. Moreover, allogeneic stem cell therapy is 100% safe, which further supports its demand on a global level. Pet owners are identified to prefer allogeneic stem cell therapy over autologous therapy, attributed to its relatively lower costs and comparative ease of the entire procedure. The actual market opportunity lies in the growing preference for allogeneic stem cells over autologous stem cells. 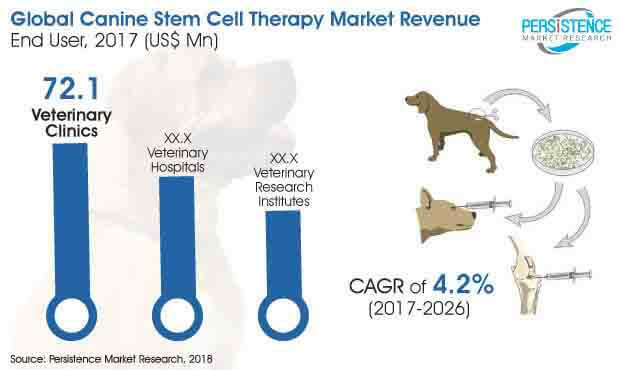 A number of stem cell therapy products for dogs are under clinical trials, which is anticipated to attract major revenues for the canine stem cell therapy market over the coming years. Currently, VetStem in collaboration with Aratana Therapeutics is making the allogeneic stem cells to treat osteoarthritis in dogs. In 2016, the company submitted a trial data of allogeneic stem cells to the FDA as a part of a licensing application. The licensing application was submitted to FDA in order to achieve marketing approval and sales support in the U.S. The clinical trial registered over 90 dogs in the study and was controlled by placebo. Furthermore, in May 2017, a nationwide stem cell study was conducted with dogs in the U.S. for the treatment of arthritis, for over a six-month period. This study created a lucrative opportunity for stem cell therapy treatment and a range of possibilities to confirm the efficacy of the technique for arthritis, which resulted in expanded revenue of the canine stem cell therapy market. Lately in 2017, a study named “Stem Cell Injections for Dogs with Chronic Severe Spinal Cord Injuries” was performed on dogs with austere chronic spinal cord injuries including disc herniation or trauma. The objective of the study was to evaluate the clinical outcome of the research on these dogs after transplantation of the canine stem cells. Growing penetration of veterinary healthcare has exponentially amplified demand for veterinaries and clinics. People seem spend more on veterinary services than on medicines. Several veterinary groups from across the world are combining their operations in order to expand their reach and secure profit in the global marketplace. In February 2017, Independent Vetcare (IVC) and Evidensia announced its intension to work as a combined entity. Evidensia marks strong presence in Northern Europe and IVC in the U.K. The collaboration helped in establishing a dynamic network of leading clinical facilities with about 500 clinics across wight countries and benefit from shared best practice and improved purchasing power. With the augmented number of veterinary clinics and veterinarians, the adoption of canine stem cell therapy is also expected to surge in near future.